The authors are interested in using desing containers to isolate implementation error-proneness. Decisions are very influencial in architecture, but there is always risk attached to it, and there might be some residual risk, which might be looked over. In this paper, they study whether it is effective to base risk assessment around risk containers that isolate related risk-inducing elements. In literature, several approaches exist. For example, Xiao et al (2014) propose Design Rule Spaces to gain architectural insights from code. 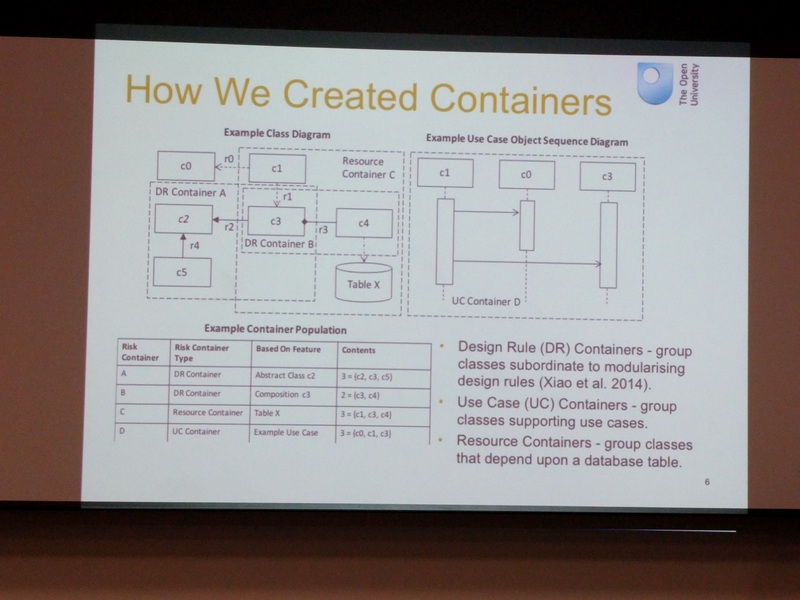 In this paper, they have tested DRSpaces on UML classes en sequence diagrams to determine whether design time risk containers can be effective. They performed two case studies. One on a Java program (87 KLOC), and one on a PL/SQL application (333 KLOC). The former has UML class diagrams and sequence diagrams. For the latter they used the module dependency graph and use case specifications. It turns out there is a high correlation between the DR containers and the risk of coupling (which sounds very logical to me), but how about real risks?